Dr. Smith's ECG Blog: Our residents are getting really good at this. Our residents are getting really good at this. It is VERY suspicious for acute inferior MI because of some ST Elevation and large and fat T-waves in II, III, aVF. 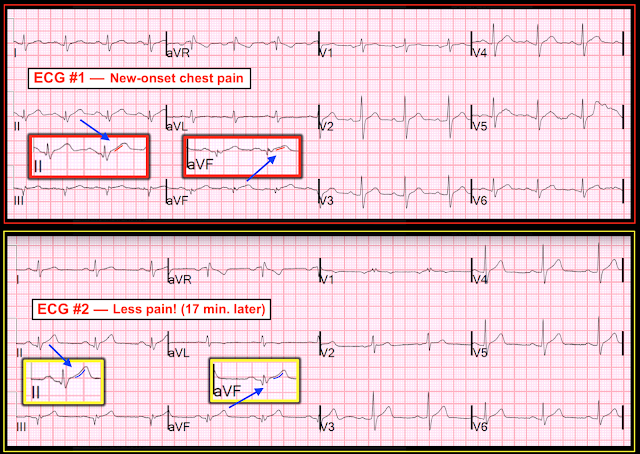 It is not diagnostic because of absence of ST Depression (or T-wave inversion) in aVL. --There are Q-waves, which suggest "old inferior MI with persistent STE" (also known as "inferior LV aneurysm") or subacute inferior MI. --However, symptoms for only 30 minutes, so it is not subacute. --On the other hand, the T-waves are too large for old MI. I am going to guess that this is acute MI. A 60-something called 911 for acute onset of diaphoresis, vomiting, and also chest pain. This was viewed by one of our fantastic 2nd year residents, BG TenBrink. And he was very suspicious of acute MI. They are getting very good at this! So he showed it to one of our junior faculty, Nick Simpson. Nick was convinced. The patient reportedly "looked terrible and continued to drip sweat." He had "nausea and multiple episodes of vomiting." He was "clammy and diaphoretic for medics." He did not receive aspirin or nitroglycerin prehospital, and "he did not endorse chest pain or shortness of breath." In emergency department, the patient began endorsing midsternal chest pain that began while he was here in the ED. He endorsed continued nausea and diaphoresis. He denied any history of heart disease. Has not had a heart attack before. Now there is some more upward concavity in lead II. See comparisons side-by-side below. RCA is a medium caliber vessel with low anterior take off. Hazy 80% stenosis is noted in the distal vessel. Lesion on Dist RCA: 80% stenosis 15 mm length reduced to 0%. Pre-procedure TIMI III flow was noted. Post Procedure TIMI III flow was present. Good run off was present.The lesion was diagnosed as a low risk lesion.The lesion was tubular and eccentric.The lesion showed evidence of thrombus presence, with irregular contour, mild angulation and mild tortuosity. Lesion plaque is ruptured. Notice how the ST segment in lead II on the first ECG is almost straight. 3rd is after stenting and there is not much difference from ECG 2. The first troponin I was below the level of detection (0.010 ng/mL), as were all subsequent troponins! Echo showed no wall motion abnormality and normal EF. Thus, the patient ruled out for MI. So how do we know that there actually was an acute coronary syndrome? 2. The "gold standard" (reference standard) is ECG evolution. If ST Elevation and/or large T-waves are due to ischemia, then when the ischemia is gone (and it always goes away at some point -- ischemia is not a chronic condition), the ST Elevation will decrease and/or T-waves become less large; if they are NOT due to ischemia, they will not change. Here we see the evolution: when the patient becomes pain free, the T-wave became less "fat". The angiogram has TIMI-3 flow, corresponding to the resolving ECG. This patient was treated so fast that he had no actual infarction. Spontaneous reperfusion certainly helped. So this is really another case of Unstable Angina. Superb case by Dr. Smith with prompt recognition and treatment of acute coronary syndrome resulting in rapid cardiac cath before any actual infarction occurred. The patient was lucky in that the 80% RCA “culprit lesion” spontaneously reperfused. The lesion was stented in the hope of preventing a future event. Figure-1: Compare the ST segment in Panel A with Panel B. What is the difference? Is this likely to be clinically significant? (See text). Recognizing Subtle ST Segment Changes — Consensus among expert electrocardiographers is lacking regarding the definition of a normal ST segment. Much of this relates to semantics — since minor ST-T wave abnormalities in a non-acute setting generally provide no more than a nonspecific suggestion to potential etiologies. That said — I feel it important to hone in on recognizing even minimal abnormalities because: i) it is good to let others reading our interpretation be aware that we saw the abnormality in question, even if we may not have thought it clinically important for the case at hand; and, ii) in an acute setting — even subtle ST-T wave abnormalities may be very important! The ST-T wave in Panel A of Figure-1 is normal. Note the smooth contour at the point of transition between the end of the S wave and the beginning of the ST segment. Note an equally smooth contour at the end of the ST segment and the point where the ascending limb of the T wave begins. There is a slight normal upward concavity at this transition between the end of the ST segment, and the beginning of the T wave. In contrast — Note the sharp angle in Panel B at the point where the straight (flat) ST segment ends and the ascending limb of the T wave begins (RED arrow). While admittedly “splitting hairs” — the ST-T wave in Panel B is not normal. Instead — there is nonspecific ST segment straightening (ie, with loss of that smooth transition between the end of the ST segment and the beginning of the T wave ascending limb). I’ll emphasize that in a non-acute setting, “nonspecific ST segment straightening” — is a descriptive finding. It is nonspecific. It may mean nothing — especially if only seen in a single lead. Or, it may suggest some other problem (ie, electrolyte disorder) — or, it may be a nonspecific indicator of underlying coronary disease. On the other hand, in an acute setting (ie, in a patient with new-onset chest pain) — even subtle ECG abnormalities, especially if present in multiple leads — may be extremely important. For this reason — recognition of subtle ST-T wave changes is an essential skill for emergency providers to master. Now look at Figure-2 — in which we compare the initial ED tracing (ECG #1) obtained during chest pain — with ECG #2 obtained 17 minutes later, at a time when chest pain had greatly decreased. To facilitate discussion of the ECG abnormalities noted by Dr. Smith above — I’ve added magnified inserts (within the RED rectangles) for the first 2 complexes in leads II and aVF of ECG #1. Similar changes in the ST-T wave are seen in lead III. In addition to slight-but-real J-point ST elevation — note straightening of the ST segment takeoff. The normal upward-concavity appearance of the ST segment (that we saw in Panel A of Figure-1) has been lost in each of the inferior leads of ECG #1. In contrast — a more normal upward-concavity appearance for the ST segment in the inferior leads has returned in ECG #2 (as shown within the YELLOW rectangle inserts for leads II and aVF). To be clear — the ST-T waves in the inferior leads for ECG #2 are by no means normal (!) — but there clearly is less ST segment straightening — and we now clearly can see some upward concavity to the ST segment in the inferior leads. 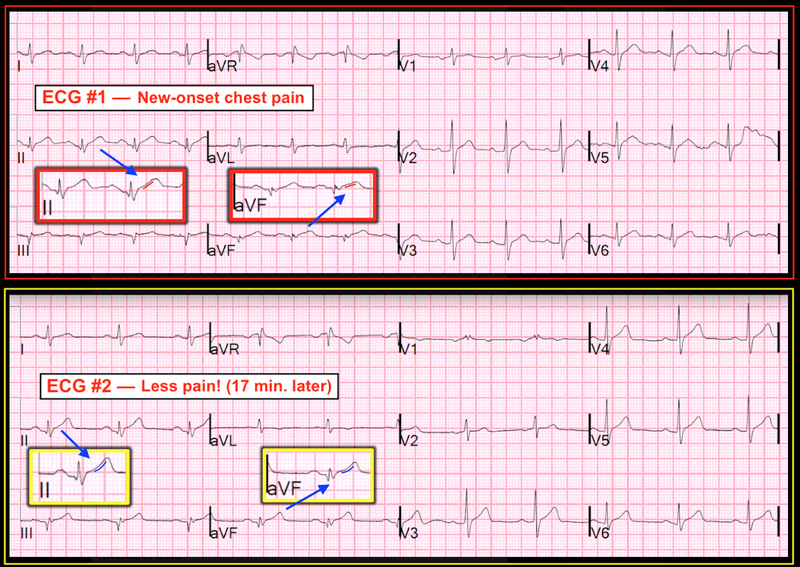 Figure-2: Comparison between the initial ECG obtained in the ED (TOP = ECG #1) — with ECG #2 (BOTTOM) obtained 17 minutes later at a time when chest pain had markedly decreased (See text). Could this patient have had prior inferior infarction? After all — there are inferior Q waves that are actually quite large considering the small size of the QRS complexes in the inferior leads. We are told that the patient had “no history of prior infarction” — and, cardiac cath did not suggest any wall motion abnormality — but given presumed significant baseline RCA narrowing, with an episode of spontaneous resolution of acute occlusion — perhaps one or more similar episodes occurred in the past? This is relevant — because (as emphasized earlier by Dr. Smith) — it is highly unusual with acute RCA occlusion (with inferior ST elevation) not to see reciprocal changes in lead aVL. Keep in mind that lead aVL in ECG #1 is not “normal” (ie, the ST segment is uncharacteristically flat) — but there is no ST depression. Could the reason for this be that the lead aVL “baseline” was abnormal from a prior event? There is a change in lead aVL in ECG #2 — in that there is now ever-so-subtle-but-real T wave inversion. This probably is another reflection of this patient’s spontaneous reperfusion. In ECG #1 — there is early transition by lead V2, with R = S in lead V1. This is not a normal appearance in lead V1, which typically shows predominant negativity. Could these findings (ie, R=S in V1 & early transition by lead V2) have similar implications as the inferior Q waves, namely reflect prior posterior infarction? Finally, note in ECG #2 that the tiny QRS complex in lead V1 now manifests an rsr’ — which in conjunction with the narrow terminal s waves in leads I and V6 suggests incomplete RBBB. That said — I suspect the reason for this change in QRS appearance in lead V1 is more likely due to lead misplacement (too high) of V1 and V2 — because the P in V1 of ECG #2 is now all negative (it was biphasic in ECG #1); there is now a negative component to the P in V2 (the P wave was all positive in V2 of ECG #1) — and leads V3-thru-V6 are virtually identical in both tracings (suggesting a technical problem may be the cause of the change in V1 and V2). Wow. This is such a great post. And excellent notes from Dr Ken Grauer! thank you again, gentlemen, Steve and Ken. was away for a while. need to catch up. Dr. Smith, suppose this case is a new STEMI, so how much possibilities that a new inferior MI can cause an early Q wave like this (in first hour)?